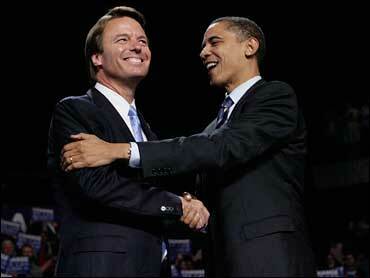 Democrat John Edwards endorsed former rival Barack Obama on Wednesday, a move designed to help solidify support for the party's likely presidential nominee even as Hillary Rodham Clinton refuses to give up her long-shot candidacy. Edwards made a surprise appearance with Obama in Grand Rapids, Mich., as the Illinois senator campaigns in a critical general election battleground state. The endorsement came a day after Clinton defeated Obama by more than 2-to-1 in the West Virginia primary. The loss highlighted Obama's challenge in winning over the "Hillary Democrats" - white, working-class voters who also supported Edwards in significant numbers before he exited the race in late January. "This is a major blow to Hillary Clinton's hopes of winning over the vast majority of superdelegates she would need to stake a claim on the nomination," said CBSNews.com senior political editor Vaughn Ververs. "In the wake of her 40-point win in West Virginia, Clinton has made a direct appeal to party leaders to at least stop and consider their choice. Having a big name still on the sidelines so quickly ignore that plea is a sign it's having little impact." Edwards, who received a thunderous ovation when Obama introduced him to a crowd of several thousand, said, "brothers and sisters, we must come together as Democrats" to defeat McCain. "We are here tonight because the Democratic voters have made their choice, and so have I." He said Obama "stands with me" in a fight to cut poverty in half within 10 years. Edwards also praised Clinton, saying "we are a stronger party" because of her involvement, and "we're going to have a stronger nominee in the fall because of her work." He said Clinton is a "woman who is made of steel. She is a leader in this country not because of her husband but because of what she has done." Clinton campaign chairman Terry McAuliffe said in a statement, "We respect John Edwards, but as the voters of West Virginia showed last night, this thing is far from over." Edwards, a former North Carolina senator and the 2004 vice presidential nominee, finished second to Obama in the Iowa caucus in early January before coming in third in the following three contests. He dropped out in New Orleans, the location a reminder of his attention to poverty. Both Obama and Clinton immediately asked Edwards for his endorsement, but he stayed mum for more than four months. His endorsement would have carried far more clout if he had made it in February, when the Obama-Clinton outcome was very much in doubt. A person close to Edwards, speaking on condition of anonymity, said he wanted to get involved now to begin unifying the party. Obama also signed on to Edwards' anti-poverty initiative, which he launched Tuesday with the goal of reducing poverty in the United States by half within 10 years. When he made his decision, Edwards didn't even tell many of his former top advisers because he wanted to inform Clinton personally, said the person close to him. Edwards' wife, Elizabeth, who has said she thinks Clinton has the superior health care plan, did not travel with him to Michigan and is not part of the endorsement. David "Mudcat" Saunders, a chief adviser for Edwards on rural affairs during his presidential campaign, said the endorsement should take some sting out of Obama's resounding loss in West Virginia. "For Barack Obama, I think he ought to kiss Johnny Edwards on the lips to kill this 41-point loss," Saunders said. Edwards waged a scrappy underdog campaign for the Democratic nomination, always outshone by the historic nature of Obama possibly being the first black nominee and Clinton the first woman. He continued to campaign after the family disclosed that Elizabeth's breast cancer had returned. Obama has 1,883 delegates and Clinton has 1,711 delegates, according to the latest tally by CBS News. Edwards is not a superdelegate. Edwards has 19 pledged delegates won in three states: Iowa, New Hampshire and South Carolina. Most of the those delegates have already been selected, meaning they are technically free to support whomever they choose at the party's national convention, regardless of Edwards' endorsement.